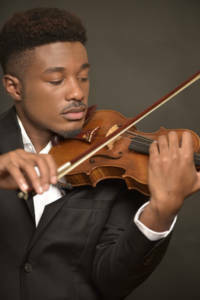 The Montclair Music Studio is Proud to Introduce Violin Instructor Jamiroquai Ellison. Jamiroquai is currently attending Montclair State University. Playing for over 12 years, Mr. Ellison’s experience includes teaching at The Blue Lake Fine Arts Camp as well as 2 years giving private lessons. Jamiroquai looks forward to creating a specific study plan for every student. This plan will be suited to the individual’s specific needs in developing a technical and musical approach to the instrument. Mr. Ellison is currently accepting students on Mondays & Tuesday. We are proud to have him with us. What instruments did You Play as a Child? I actually studied the cello for a few years alongside the violin. I was pretty successful but it never stuck with me. When I got into high school I decided to play the trumpet and baritone when I joined marching band. Those were some fun times. My uncle is actually apart of an old 90s rap group call Lords of the Underground. His stage name is Mr. Funky. Have You Participated in Any Extra Curricular Organizations? Besides making music as a professional performer in the NYC area I also play at church on Sundays, I volunteer for rehearsal at the musicians’ unions in NYC and things like that. I recently had the opportunity to play a couple of concerts back to back at Carnegie Hall. I played a couple of months ago at the Apollo Theater in Harlem NY for their fundraiser, among other venues such as Dizzy’s Jazz Club and others. As a music therapy major, I also know my way around a piano and guitar. What are Your Favorite Hobbies Other than Music? Honestly, I love writing poetry and going dancing as well.